Note: The Colorado 300 does not include pre-loaded maps, other than the standard global basemap. The 400 series includes preloaded maps: The 400t includes U.S. topographic maps, the 400i includes maps of coastal and inland (freshwater) rivers and lakes. The 400c includes BlueChart nautical charts for U.S. coastal waters and the Bahamas. Like the 5-star rated Garmin 60csx, the Colorado is versatile, serving the mariner, inland fisherman, or mountaineer, and even providing turn-by-turn directions on the way home in the car. What you’ll notice immediately is the Colorado’s "Rock ‘n Roller" wheel, which has drawn comparisons to iPods clickwheel. Its operation is easy and intuitive and allows you to operate the unit with one hand. You can use the wheel to pan and zoom maps or make your way through the menu system. Intuitively, perhaps because of iPod’s success with the clickwheel, the enter button is positioned in the center of the wheel. Wired Magazine sums up the Colorado’s design as, "Unbeatable form factor." Other next-generation features include the new 3D view on a large and very rreadable color screen. Enter 3D mode to go beyond the standard map view from above. Use the pan and zoom features to change your perspective and see the terrain you’re navigating from different angles. This can be very helpful to navigation, as not all of us can easily visualize terrain as drawn on topo maps. The Colorado is versatile, and allows you to customize up to five profiles — automotive, marine, recreation, fitness or "paperless" geocaching (see below). making the most beneficial features for each activity the easiest to access through quick shortcuts. In addition, you can further customize your Colorado with the purchase of additional maps on SD card, including topo, marine and road maps. 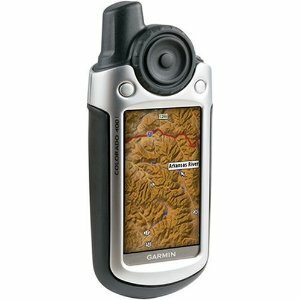 The Garmin Colorado takes the popular sport of geocaching seriously and sets a new standard in providing integrated geocaching features. Many of the most favorable owner reviews of the Garmin Colorado are from geocachers — many of whom have upgraded from old handhelds to the Colorado — who have delighted in the advance of geocaching features this unit offers. In addition to a geocaching mode that customizes the unit’s operation toward finding that hidden cache, the Colorado offers so-called "paperless" geocaching. No need to scribble latitude/longitude coordinates of caches on scraps of paper. With the Colorado, you can simply download them from geocaching.com or any other source using the GPX standard. The unit’s built-in barometric altimeter provides you with altitude information while the built-in electronic compass is essential for guiding you when you’re moving very slowly or standing still. Garmin succeeds in providing a geocaching powertool that does it all — and one-handed, to boot. The Colorado is also equipped with features for playing the new Wherigo location based-adventures and games. Whatever your sport, if more than one of you are carrying a Colorado you can share information wirelessly, including waypoints, routes, tracks, and geocache information. Garmin has also added a wireless feature to the Colorado which allows it to communicate with your heart rate monitor. In our monitoring of owner reviews, we’ve noted that early versions of Garmin’s firmware was buggy, causing the unit to lock up at times. Subsequent firmware releases (user-updatable via your connected PC) have largely addressed this issue, however.